We were on a hunt for gold. 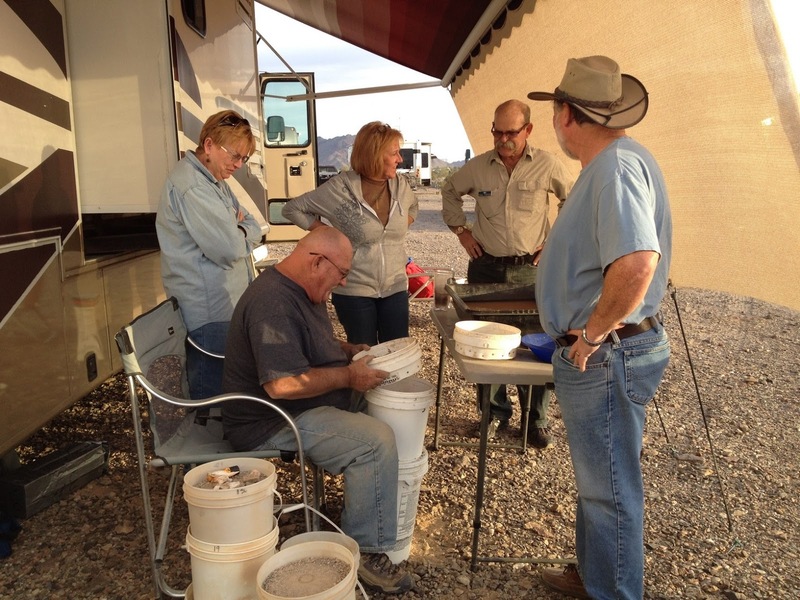 We figured there had to be a lot of gold around Quartzsite. After all there are all kinds of gold mining tools and equipment available for sale around this area. There are also lots of how-to books and clubs. Why else would people be interested in this stuff if gold wasn’t around? Monday we decided to do a little prospecting of our own. We had no intention of claim jumping. There are plenty of mining claim markers out in the desert We had no clue someone would stake out a claim unless there was real gold out there. We were going to go look. 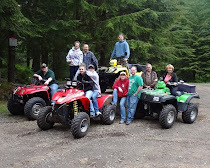 There were eight of us on this outing. We were all going in our own separate rigs. After all, someone might want to return early and someone else might want to stay late. We hit the trail about 11:00. It was definitely a trail and a mighty dusty one. We had unpaved roads and washes to travel through. It was a very dusty ride. At our first stop we were given a little instruction and background. We were told about the mountain lions and other important things we needed to be aware of. We stopped to check out a little cave. This would make a great place to stay out of the elements Certainly it has been claimed by some at times. We just didn’t want to meet anyone or anything that might still be using this cave. Letting the air out of the tire and hoping for an easier ride. Once we selected our desired location the metal detectors came out and the miners or prospectors went to work. Looking for gold doesn't stop out in the hot fields. 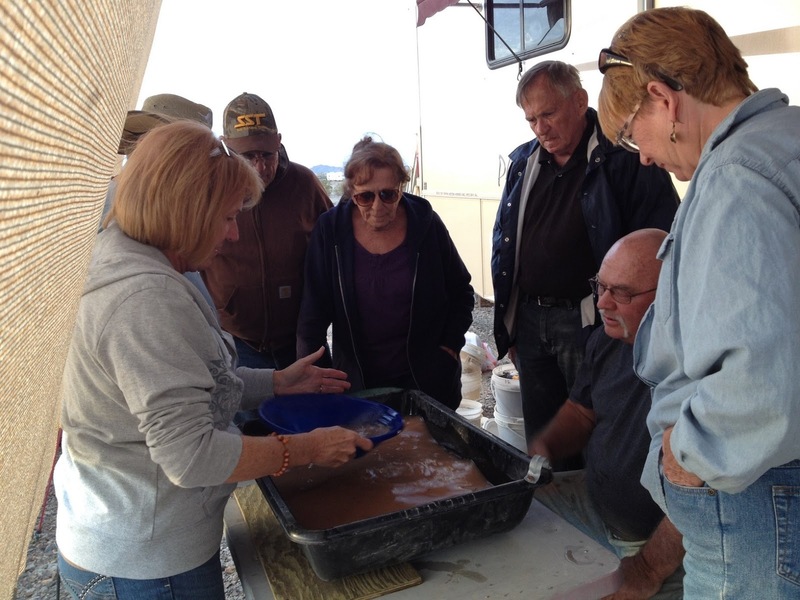 It continues on with lessons in panning and sifting using screens. Did we really strike gold? Now that I’ve shown you pictures of where we dug, do you think I’d answer that? I'd say you guys all got skunked! I knew Nevada had gold mines but didn't realize the Q area did as well. Maybe that cave was the place to look after all. Oh such fun ! That red "JAG" you once had sure would have been great on your adventure. I think if you struck gold...big gold that is...we wouldn't be reading this blog. Y'all would be out celebrating all night. Am I right? Just being able to wander about the desert in great weather, exploring is striking gold! I know you didn't find any gold, because if you did, this post would have come from some exotic location like the French Rivera, where you'd be sipping cool adult beverages on the deck of your mega yacht. What a tease! No you didn't find any because if you did you would certainly be showing it off. This just looks like the very same place we scouted out 2 years ago. Lots of mine claims around those parts.